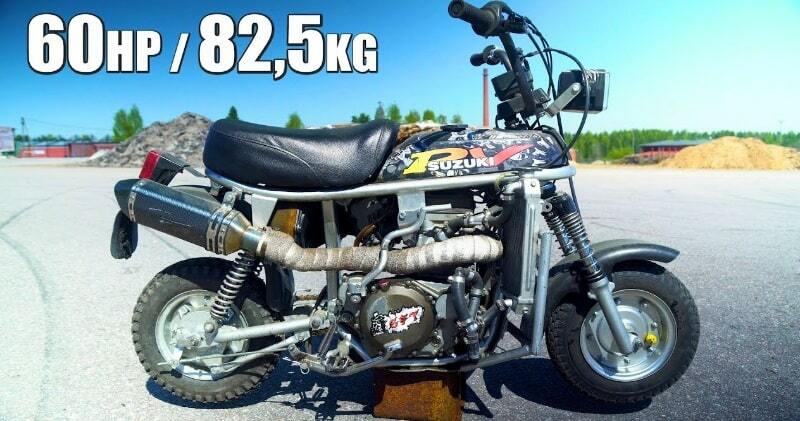 A Suzuki PV 50, has been removed his small moped engine and have installed a Kawasaki KX450F engine of 450 cc, which was prepared for supermotard. If we take into account that it has a performance of about 60 hp of power and that the bike does not exceed 82.5 kg of weight, we have a power-to-weight ratio of crazy: 0.72 hp / kg. With such small wheels, the drifts come almost alone and in the hands of these sorcerers of the pirouettes,the infinite ponies, the tops and the skids are a constant. At a given moment, they measure the maximum speed reached, exceeding 111 km / h, a lot considering the diameter of the wheels Of course, it seems that fear comes at the time of braking, with two drum brakes that surely are not prepared to stop so much power.